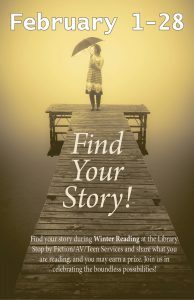 Our Winter Reading Program runs the entire month of February, and this year’s theme is Find Your Story. At the Fiction/AV/Teen Department we encourage you to celebrate the story you love, be it a favorite detective, a science fiction series, a graphic novel, a hero, an adventurer, a specific genre, or whatever captivates you. Throughout the second floor we will have displays that offer various themes to help you find your story. For every book you read you can enter our drawing for one of six prizes that will allow you to express your story. Additionally, if you’d like to recommend a favorite book to your fellow readers, you can add your titles to our wall of reader suggestions, just across from the Fiction/AV/Teen desk. Stop by the second floor to participate!